As Chair of the Assembly's Task Force on New Americans, my job is to advance, expand and protect the rights of New Americans in the state of New York. Whether it is fighting for the rights of day laborers, demanding increased funding for education or asking for interpreting services at hospitals, my efforts have been directed toward searching for solutions to the problems that affect immigrant communities in New York. Once more I wish to thank those individuals and community groups who provided us with support throughout the year. As a legislator and member of the Assembly, 'the people's house,' it is vital to hear from you so that together we can help those in need, whether they are recent immigrants or third generation. Please let us know how we are doing. 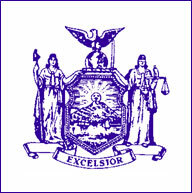 At the end of this report, which provides an overview of our work and legislation, you will find contact information for both Albany and New York City offices. For many immigrants in New York State this has become an unfortunate reality. The Department of Motor Vehicles (DMV) is implementing a new policy to revoke the driver's licenses of residents whose records have an incomplete, incorrect or mismatched Social Security number. So far, the DMV has suspended the licenses of 1,700 people, and sent out as many as 112,000 more notices to drivers. The effect of this policy is being felt disproportionately by immigrant communities in New York State. Proponents of restrictions on immigrants' access to driver's licenses argue that such restrictions discourage illegal immigration, improve national security and prevent fraud. This is nothing but a red herring. This policy is being used to discriminate against minorities. Forty-four states, including New York, require a social security number to obtain a driver's license. 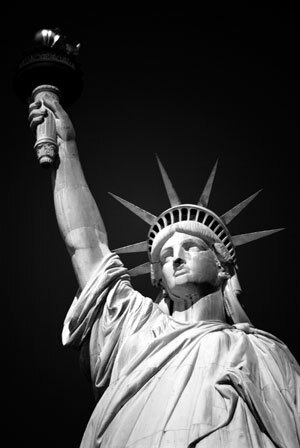 This has not deterred immigrants from coming or made existing ones return to their countries of origin. The majority of immigrants are simply hard working people trying to create a better life for themselves and their families. The purpose of issuing driver's licenses should be to regulate the industry by ensuring that all drivers are tested, able to obtain auto insurance and register their vehicles, and not to "catch" undocumented immigrants. Restricting immigrant access to driver's licenses undermines national security. Every name, address and other personal information recorded by DMV becomes part of a database that can be used for law enforcement. With this new policy, even more people will fall under the authorities' radar. This is a very ineffective way to prevent terrorism. In many states, law enforcement officials support the elimination of these restrictions. Community ties with the police, which are built on trust, would disappear if people are afraid to be deported, and immigrants would be less likely to report crimes and assist authorities in fighting criminal and terrorist activity. We should listen to those who are closely in touch with our communities. When restrictions on driver's licenses increase, there is a proliferation of false documents. In many instances, this forces the DMV to become an immigration check point, a position they are poorly equipped to perform. This job is better left to the Department of Homeland Security officials who trained for weeks to identify documents and interpret the relevant laws. There are better alternatives that would ensure equal rights for everyone. 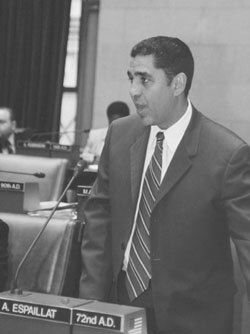 Task Force Chair Adriano Espaillat discussed some of these alternatives at a hearing held by the Assembly's Standing Committee on Transportation on August 18, 2004 regarding DMV Driver's Licenses Issues. For example, Assemblymember Ortiz has introduced bill No. A5690 to allow the substitution of a Social Security Number with a federal individual identification number. Also, Assemblymember Peralta has introduced bill No. A10352 which would exclude a Social Security Number from the documentation required to renew an existing driver's license. Please call you Assembly member to remind him/her that it is in the public's best interest for ALL New York residents to have access to driver's licenses regardless of their immigration status. Task Force Chair Adriano Espaillat speaks out against DMV's new policy at a rally organized by the Asociacion Tepeyac of New York, a pro-immigrant advocacy group. Task Force Chair Adriano Espaillat introduces bill No. A5431 to make available interpretation and translation services at hospitals. The time to provide interpretation and translation services at hospitals to limited English speaking patients is NOW! You probably know someone, a friend or a relative, with limited English language skills who has called a hospital or clinic to make an appointment, inquire about an invoice or ask about the results of a test, only to be told "I do not speak Spanish (or Russian, Chinese, Haitian Creole, etc. ), good-bye." The reality is that too many hospitals are failing to communicate with their limited English speaking patients in a language they can understand, and in effect preventing them from obtaining the emergency, primary and preventive health care services they need. At a hearing held by the Task Force on New Americans on this subject, more than 45 people testified, including the State Attorney General Eliot Spitzer. Their testimony clearly revealed that there is a systematic absence of comprehensive strategies for providing language assistance, ineffective use of existing language resources, inadequate training of staff, inappropriate language assistance practices and a lack of quality controls to ensure reliable and accurate interpretation and translation at hospitals statewide. In addition, we found that patients experienced unreasonable delays in service, difficulties communicating with hospital staff and occasionally a complete lack of service for those unable to provide their own interpreter. Task Force Chair, Assemblymember Adriano Espaillat, has introduced bill A5431-B to provide a solution to this problem. This bill would require every hospital to provide language assistance to ensure access to services such as health care, billing and making appointments. With this law in place, patients with limited English language skills would not be forced to rely on unqualified interpreters such as minor children and other family members to translate for them. Meaningful language access can substantially improve the health and quality of life of many immigrants and their families. The bill was passed in the Assembly and referred to the Senate. Call your Senator and tell him/her that the time to pass this legislation is NOW! This annual event is organized by the New York Immigration Coalition, and it is co-sponsored by the Task Force. Every year, hundreds of community advocates and organizations attend this event to bring attention to vital issues that affect new Americans in New York. 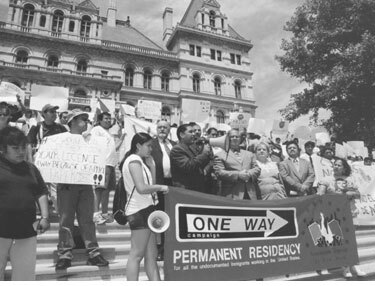 On March 16, 2004, more than 500 community activists came to the Capitol to talk with their representatives about interpretation services at hospitals, the right to have a driver's license in New York, to show opposition to the CLEAR Act, and to request increased funding for primary, secondary and higher education. In previous years, participants have also addressed issues such as health care, funding for legal assistance and availability of language programs for English Language Learners. For more information, or if you would like to participate in Immigrants' Day 2005, please contact the New York Immigration Coalition at 212-627-2227. Recent federal legislation requires that banking institutions carefully scrutinize identifying documents presented by foreign nationals seeking to open new accounts. Increasingly, Colombian and Dominican nationals residing in the state of New York have tried to use their consular identification card as their primary form of identification to do business at these banking institutions. Task Force Chair, Adriano Espaillat, introduced bill No. A10812 requiring banking institutions (including all banks, trust companies, savings banks, savings and loan associations, licensed foreign banks and credit unions) to accept the Dominican consular identification card as a valid form of identification for all banking transactions. The bill was referred to the Assembly's Banks Committee for consideration. At the federal level, Congressman Ruben Hinojosa has introduced a bill that would authorize financial institutions to accept a matricula consular issued by a duly authorized consular officer of the Government of Mexico as a valid form of identification. According to the bill's findings, accepting the matricula consular as a form of identification would benefit not only Mexican immigrants, but also banks and other financial institutions because they would have access to a new, fast-growing market. Bill H.R. 773 was referred to the House of Representatives' Subcommittee on Financial Institutions and Consumer Credit for consideration. One of the most anti-immigrant pieces of federal legislation in recent times is currently making its way through Congress, and gaining more support every day. The Clear Law Enforcement for Criminal Removal Act of 2003 (HR2671 - CLEAR Act), introduced by Representative Charlie Norwood, has as of today 125 co-sponsors in the House of Representatives. A similar bill, the Homeland Security Enhancement Act (S1906), was also introduced in the Senate by Senator Jeff Sessions. If the CLEAR Act becomes law, it would, for the first time in the history of this country, criminalize all immigration status violations, including failure to report a change of address or to carry your foreign passport at all times. It would also require that state and local police departments start enforcing federal civil immigration laws. The Task Force Chair, Assemblymember Adriano Espaillat, has introduced a Resolution opposing the CLEAR Act. If enacted, the CLEAR Act would lead to racial profiling and other civil rights violations, damage community-police relations, and economically and physically overburden state and local police departments. We strongly urge you to contact your federal representative and senator to voice your opposition to this legislation. RESOLVED, That copies of this Resolution, suitably engrossed, be transmitted to the President and Congress of the United States. The following bills were introduced by Task Force Chair Adriano Espaillat and his colleagues to address many of the issues that affect New Americans in the State of New York. Please contact the Task Force or the sponsors if you would like to obtain more information about these bills. A8970 (Rivera P) - Requires a defense attorney to advise a defendant that if he is an alien and he is convicted of a crime, whether by plea or trial, such conviction may result in his deportation; allows a withdrawal of a guilty plea if the alien is threatened with deportation and is not so advised of such threat of deportation.